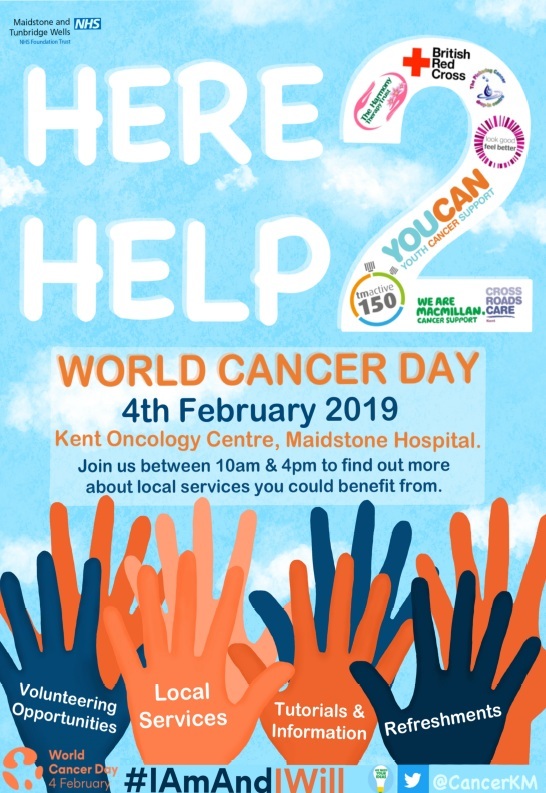 In support of World Cancer Day on 4 February, Maidstone Hospital will be hosting the Here2Help event between 10am-4pm with partner organisations on hand to give out advice about cancer services on your area. Look Good, Feel Better provide small group make-up workshops for women with cancer to boost their self-confidence and well-being, these run monthly at MTW. Everyone that attends receives a gift bag including a variety of products from well-known brands completely free of charge. The charity will also be launching a men’s event here in April. They will be offering make-up/skincare advice and have a few products to give away throughout the day. TMActive provide services at local leisure centres including an exercise referral programme which many patients could potentially benefit from.They will be offering seated circuit session (so suitable for all) for small groups at regular intervals throughout the day and providing advice and information. YouCan provide support for people aged under 35 affected by cancer in Kent & Medway, they will be providing information about the services that they can provide which include counselling, complementary therapies and access to an affordable holiday home by the coast. The British Red Cross are able to offer a loan/hire service for equipment such as wheelchairs and other home aids, they will be bringing a range of this equipment for people to see. Macmillan Crossroads provide a variety of services including be-friending and practical support at home. The Pickering Centre are situated in Tunbridge Wells and provide services including emotional support, counselling and complementary therapies. The Harmony Therapy Trust are able to offer a variety of complementary therapies either free or at a substantially reduced cost to patients in their own homes throughout Kent & Medway and will be offering free hand massages throughout the day. The volunteers will be providing tea and coffee, there will be a presence from the management team at the Oncology Centre, the information project team will be there seeking engagement via our project questionnaires and there will also be someone to talk to about volunteering opportunities within Oncology and the Trust itself.